Now at 33 1/3 RPM! Gatefold jacket with extra photos! There are a handful of landmark albums in any genre. 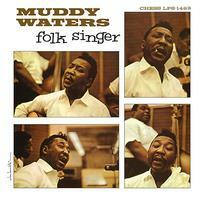 In the blues, one of them is Muddy Waters' Folk Singer. It's been an audiophile staple for years. Originally released in 1964, Folk Singer was the only acoustic album Waters ever recorded, thus becoming the first and perhaps best blues concept album ever. Muddy of course started out playing acoustic blues in the Delta, and he's clearly very comfortable in this return to his roots, which was designed to appeal to the mid-1960s surge of interest in folk music. No brainer purchase for your collection! Solid gatefold w/ beautiful photographs and a dead quiet pressing brings Muddy and the guys into your living room! I'm sure the 45 is superb, but I am more than satisfied for the wait for this 33.